While many associate the word "bankruptcy" with "epic failure", history shows us that through the adversity of life one must use knowledge and tenacity to turn "epic failure" into, just, "epic". In 1923, Walt Disney's creditors forced bankruptcy upon him and assumed his assets to settle his debts. Likewise, after many ups and downs, including being fired from the company he created, Steve Jobs returned to Apple in the mid 90's while it was on the verge of bankruptcy. Today, Apple sits as one of the most powerful and highly valued companies in the world, with a net worth over 65 billion dollars. 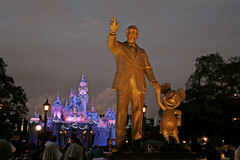 Walt Disney was reportedly worth over $1 billion when he passed, and Disney continues to be a household name in places across the world. So, what happened? 1 Comments to "A Lesson in Tenacity From Walt Disney and Steve Jobs"
That's true. Even the rich and famous file bankruptcy and often think about less or have less problems filing than others. Post a Comment to "A Lesson in Tenacity From Walt Disney and Steve Jobs"